But the problem with website redesign is that some people think it’s a cure-all for every problem you have. But some problems won’t be solved by a massive web redesign. Visitors don’t stay for long. It’s easy to blame your web design for this problem, but a massive change may not be your most ideal solution. It may be just a simple case of making a few crucial changes instead of wholesale upheavals to your website. Is the content visitors are looking for actually present in your site? Can visitors navigate easily to the right page? And when they see the info, is it presented in such a way as to compel the visitor to take a look? As you can see, you may just need some new content, a few usability ad navigational tweaks, and a more convincing presentation to solve your problem. If this is your problem, then it’s more a matter of SEO than anything else. But if your SEO efforts are actually working, then to improve business you don’t really need more traffic. You need a better conversion rate. Think about it. If you have 10,000 visitors a day and only 5 of them do business with you, you don’t need another 10,000 new visitors to increase business to 10 visitors. You need a way to convince more of those original 10,000 people to do business with you. Hence, you don’t need a new website redesign to boost traffic. But you can use web redesign to boost conversion. Marketing newbies are always twitchy about “leads”. They’re always sure that they want more these things. But a web redesign is not the way to go about it. Remember, you don’t get leads because you have a new web design. What you need on your website is content that’s high-quality and also shareable. You also need to foster your online relationships. And of course, you also need products and services that customers actually want to get for themselves. If these are your problems, then you may not need a massive website redesign. What you need are a few tweaks, instead of a massive overhaul. 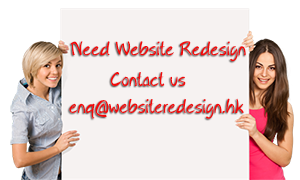 For details of your web redesign, we suggest to contact us for a further site investigation.